1. America's Great Debate: Henry Clay, Stephen A. Douglas, and the Compromise That Preserved the Union by Fergus M. Bordewich (Simon & Schuster, 2012). Another history of the Compromise of 1850. Being unfamiliar with Bordewich's other works, I have no opinion on what to expect. 2. Marching With Sherman: Through Georgia and the Carolinas With the 154th New York by Mark H. Dunkelman (LSU Pr, 2012). Mark Dunkelman adds yet another volume to his remarkable series of books following the 154th NYVI's Civil War journey. This time, the reader joins the New Yorkers from the fall of Atlanta through the March to the Sea, concluding with final victory in North Carolina. Perspectives from the men, as well as the civilians they encountered, are offered. 3. War Upon the Land: Military Strategy and the Transformation of Southern Landscapes During the American Civil War by Lisa M. Brady (Univ of Georgia Pr, 2012). Focusing on Vicksburg, the 1864 Shenandoah Valley, and Sherman's Georgia and Carolinas Campaigns, this book analyzes alteration and destruction of the natural environment as part of Civil War military strategy. The cultural impact of these actions is an important aspect of the book. Lundberg: "GRANBURY'S TEXAS BRIGADE: Diehard Western Confederates"
The dysfunctional nature of the Confederate Army of Tennessee's high command has been well documented, but many of the army's lower echelon formations were second to none in terms of leadership and combat performance. Among these is the Texas Brigade of Hiram Granbury, a unit that coalesced in the aftermath of Chickamauga and fought ferociously as part of Patrick Cleburne's famous division during the Chattanooga, Atlanta, and 1864 Tennessee campaigns, the latter witnessing Granbury's death and the wreck of his command at Franklin. John Lundberg's Granbury's Texas Brigade: Diehard Western Confederates is an organizational, command, and service history of this hard fighting formation. Eventually, eight regiments would form Granbury's Brigade -- the 6th, 7th, and 10th Texas infantries and 15th, 17th, 18th, 24th, and 25th Texas regiments of dismounted cavalry -- with losses from desertion, casualties, and disease leading most to undergo consolidation. Widely differing paths were taken by these Texas regiments prior to Granbury's appointment to brigade command, and Lundberg traces the organization and history of each. Some, like Granbury's own 7th Texas Infantry get more attention than others. The 7th fought at Fort Donelson and was captured there, returning from parole to participate in the Vicksburg Campaign, where the regiment distinguished itself at Raymond. After training in their home state, the other Texans were sent to Arkansas. Captured at Arkansas Post in January of 1863, they suffered a similar fate to the 7th in their first major action. Instead of being immediately paroled, as they expected, these men were imprisoned for a time, not fighting again until September at Chickamauga. As stated before, it was after that terrible battle that Granbury's Brigade would be formed. Their brick solid Chattanooga Campaign defense of Tunnel Hill and Ringgold Gap presaged later heroics during the Atlanta Campaign (especially Pickett's Mill), Franklin, and Nashville. Using a variety of published and unpublished sources, Lundberg satisfactorily describes these events, and the specific role played by the Texans. Three major themes emerge in Lundberg's work. His study of the regiments comprising Granbury's brigade led him to reject the thesis promoted by some historians (perhaps most famously in Why the South Lost the Civil War by Beringer et al) that a lack of Confederate nationalism was a critical factor in eroding the morale and effectiveness of the military units and the support of the home front. Although he does not examine their claims in depth, he cites the work of Gary Gallagher and Jason Phillips as offering similar thoughts to his own1. Lundberg's argument that the early war high rate of desertion in the cavalry units of Granbury's brigade [the result of being forced to give up their horses and, after prison, the order to leave the Trans-Mississippi behind for the West] did not represent a lack of faith in the Confederacy but rather a desire to serve nearer home is only partially persuasive. He supports this contention with the fact that most of these deserters and escapees from Arkansas Post rejoined other Confederate units closer to home, an important point unappreciated (according to Lundberg) in Mark Weitz's well regarded study of desertion More Damning Than Slaughter. On the other hand, one might argue with similar force that it is just this kind of trumping of national interests by local loyalties that critics contend ultimately undermined the Confederate war effort. More persuasive are Lundberg's two themes related to unit cohesion. The idea that the exceptionally high degree of battlefield cohesion and combat effectiveness exhibited by Granbury's Brigade was in large part forged by their shared experience of capture and imprisonment, with a dual desire to prove themselves and get back at their captors (although the harshness of the captivity varied), carries the ring of truth. The binding effect that top shelf leadership at regiment, brigade, and division levels had on the men is also apparent, with localized victories on Granbury's tactical front in so many fights serving to counterbalance the overall sting of defeat at the army level. Maps are absent for some campaigns, but key inclusions (for Arkansas Post, Tunnel Hill, Pickett's Mill, Bald Hill, and Franklin) show the tactical deployments of all the regiments of Granbury's brigade. With shifting unit composition over time, brigade studies, in contrast to regimental histories, rarely address unit demography. This is not the case here. In the main text, and in the appendices, Lundberg compares and contrasts the socioeconomic makeup of the brigade with other Texas military and civilian groups. As other researchers have discovered, the regiments formed after the initial rush of enlistment (in this case, the brigade's higher deserting dismounted cavalry regiments) were composed of older men far more likely to be married, factors consistent with a desire to fight as close to home as possible. Granbury's Texas Brigade is a well researched and thoughtful military and social history study. Author John Lundberg not only describes how the brigade conducted their battles but why they fought so well for so long. One of the finest combat formations in the western theater has finally been accorded the coverage and quality of scholarship it deserves2. 1 - The point is well taken but Lundberg's repetition of the similarity of his own findings to those found in Gallagher's The Confederate War and Phillip's Diehard Rebels at the beginning and ending of every chapter (or nearly so) is unnecessary. 2 - In his introduction, Lundberg notes two previous noteworthy but brief and/or flawed studies. James McCaffrey's This Band of Heroes (TAMU Press, 1984) is sketch length and Danny Sessums's doctoral dissertation "A Force to be Reckoned With" apparently has presentation issues. 1. The Boys of Company K: Ohio Cavalry Soldiers in the West During the Civil War by Lee M. Cullimore (High Plains Press). In 2005, Robert Huhn Jones's Guarding the Overland Trails: The Eleventh Ohio Cavalry in the Civil War was published by venerable western history publisher Arthur H. Clark. It's a pretty good account of the service of a volunteer cavalry unit on the plains (Wyoming, Colorado, Nebraska, and Kansas) during the Civil War and the Powder River Expedition soon after its end. Cullimore's company history goes even more micro [why Co. K? -- I guess I will find out]. 2. Ending the Civil War: The Bloody Year from Grant's Promotion to Lincoln's Assassination by Benton Rain Patterson (McFarland, 2012). It came to my attention this week that Brian Lamb, founder and CEO of C-SPAN, is retiring after almost 35 years at the helm. Roger Ebert's review of the excellent French ambiguous thriller Cache opined that no television program consisting of host and guest discussion of serious books is possible in the U.S. (unlike in France, where apparently mainstream shows like that do exist), but Lamb's BookTV on basic cable's CSPAN-2 has come as close as any. 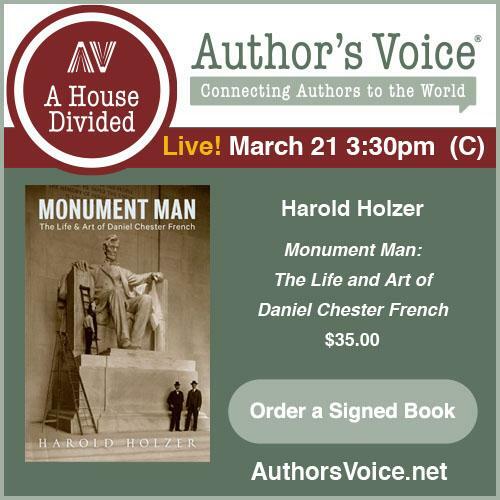 Civil War authors and publishers, as well as viewers, have benefited from countless hours of Civil War related author interviews, presentations, and aired history conferences. It's not for everyone, but I came to appreciate Lamb's sedate interviewing style and sometimes maddeningly unnecessary coyness about his own knowledge and understanding of historical persons and events. His queries to authors were never the meandering five minute affairs that so many interviewers (and insufferable audience and call-in members) employ as a preamble designed to assure everyone of the questioner's self-proclaimed foundation of expertise. But this is only part of the viewing pleasure that Lamb's C-SPAN and its inevitable offshoots have provided over the years. The American Presidents: Life Portraits and American Writers programs were some of the most enjoyable hours I've ever spent in front of the television. Enjoy your retirement, Mr. Lamb. You deserve it. And thank you for not suing me for calling my 'new arrivals' section Booknotes. * The CSS Virginia: Sink Before Surrender by John V. Quarstein (The History Pr, 2012). Quarstein has written a number of books about the sea and land Civil War on the eastern stretch of the Virginia Peninsula, the most recent a short history of the Big Bethel battle. This large book (nearly 600 pages) offers much in the way of detail about the crew and career of the CSS Virginia, not the least of which is an extensive roster. The 4th edition of the Historical Atlas of Oklahoma, newly released in paperback (the hardcover was published in 2006), is the result of four decades of continuous updating and topical expansion. In addition to James Anderson's 170 color maps, and dozens more charts and tables, new to this edition are sections on ethnic and women's history, as well as a register of artists associated with the state. Joining general editors Goins and Goble, are a host of other contributors applying their expertise in the social and natural sciences. Subjects are generally accorded two pages, with the map image (or images) on the right, faced by a page length explanatory essay located opposite. Countless topics are presented in the atlas, and these are grouped into six parts. Part I deals with the geology, topography, weather, vegetation, and natural resources (oil, gas, minerals) of the state. 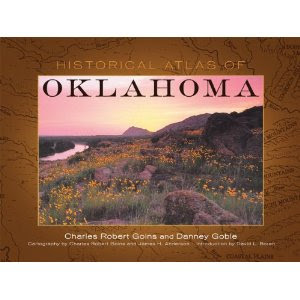 Maps associated with the thousands of years of Oklahoma settlement and exploration comprise Part II. III mainly addresses the U.S. government's formation of the Indian Territory and their forced resettlement of various tribes there. Emigration routes, roads, trails, forts, camps, are located here, as well as missions and schools. The Civil War years lie in this section, but the entire period is only covered by a single map with dots denoting significant sites. Coverage of battles, of which there were many, is limited to a short series of capsule descriptions corresponding to the site labels. Considering how important, and in many ways devastating, the war was to the Indian Territory's population, increased coverage in future editions is warranted. Part IV takes the territory to statehood, tracing cattle trails, the latest tribal land allotments, ethnic settlement, and railroads. Issues of early statehood (e.g. among them farming, political boundaries and movements, racial conflicts, and transportation) appear in Part V, with the final section taking the reader to the present using data from the most recent census. Population changes, transportation networks, political districts, education, parks, architecture, and the arts are all found in Part VI. The book itself is of fine material quality, its thick, glossy paper stock an excellent medium for presenting the book's range of full color maps and illustrations. While the atlas is perhaps most useful for those concerned with more recent history, anyone with an abiding interest in the natural and human history of Oklahoma will want to pick up a copy of this new edition of the Historical Atlas of Oklahoma. 1. Misadventures of a Civil War Submarine: Iron, Guns, and Pearls by James P. Delgado (TAMU Pr, 2012). Inventor Julius Kroehl had the visionary idea of building a deep diving submarine for the Union navy. Unfortunately, it never saw service during the war and the completed ship ended up with a less illustrious maritime history with Panama's pearl industry. The author encountered the wreck while on vacation and, unsatisfied with the conjectures of the locals as to what it was, launched an investigation of his own. Sounds interesting. I'm curious about its design, and how it differs from the shallow depth designs of the era like the Hunley and the Alligator. 2. Still the Arena of Civil War: Violence and Turmoil in Reconstruction Texas, 1865-1874 edited by Kenneth W. Howell (Univ of N Texas Pr, 2012). Sixteen essays grace this volume. Topics include: "the role of the Freedmen’s Bureau and the occupying army, focusing on both sides of the violence. Several contributors analyze the origins of the Ku Klux Klan and its operations in Texas, how the Texas State Police attempted to quell the violence, and Tejano adjustment to Reconstruction. Other chapters focus on violence against African-American women, the failure of Governor Throckmorton to establish law and order, and the role of newspaper editors influencing popular opinion. Finally, several contributors study Reconstruction by region in the Lower Brazos River Valley and in Lavaca County." 3. Antebellum Jefferson, Texas: Everyday Life in an East Texas Town by Jacques D. Bagur (Univ of N Texas Pr, 2012). A massive 600+ page history of a port community located north of Marshall, Texas and west of Shreveport, Louisiana and situated to take advantage of Red River steamboat commerce. I don't know if there is much in the way of extension into the Civil War years, but the table of contents seems to indicate coverage of every conceivable subject related to the town's antebellum development. 4. Cape Fear Confederates: The 18th North Carolina Regiment in the Civil War by James Gillispie (McFarland, 2012). The regiment saddled with the unenviable weight of having loosed the friendly fire volley that cut down Stonewall Jackson at Chancellorsville, the 18th instead deserves to be recognized for its long service with the ANV from the Peninsula to Appomattox. Unlike many other regimental histories from this publisher, the book does not include a full roster. It's possible that no single person knows more about ground level guerrilla violence across the entire geographical sweep of Missouri during the Civil War than Bruce Nichols. 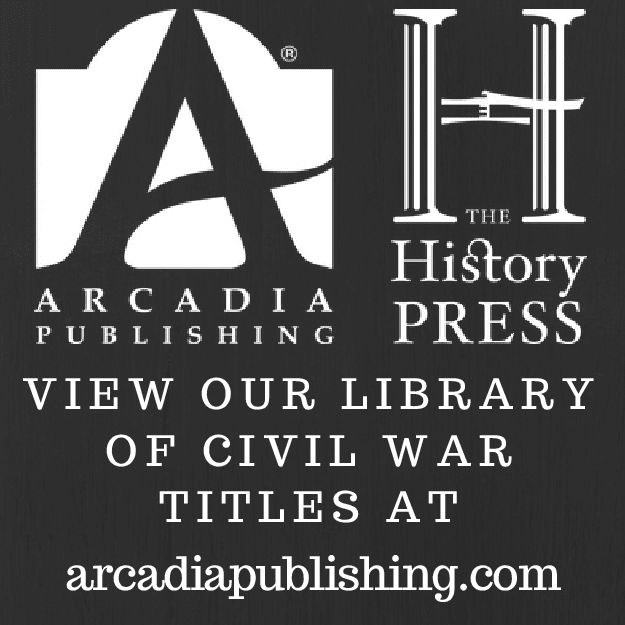 Expensive hardcover editions of his two books remain available both new and used, but reasonably priced (the $25 price tag constituting a nice departure from the publisher's norm) paperback editions of Guerrilla Warfare in Civil War Missouri, 1862 and Guerrilla Warfare in Civil War Missouri, 1863 have just been released. In nature, both books are better categorized as reference works (organized by season and geographical quadrant) than narrative histories. Nichols's research is impeccable and he does not glorify the exploits of bushwhackers nor does he get hung up on the most notorious of the bunch. Instead he's searched the literature and archives high and low in a mission to describe as many instances of guerrilla violence as possible, located in every nook and cranny of the state. It's my understanding that the third volume will combine 1864 and 1865, but I have no idea of its progress toward publication. * Granbury's Texas Brigade: Diehard Western Confederates by John R. Lundberg (LSU Pr, 2012). More than just a brigade led by a guy with cool hair, the Texas Brigade of the Army of Tennessee (Granbury's from Chattanooga until his death at Franklin) forged an enviable combat record from Donelson through to the final death throes of the Confederate western army in North Carolina. I'd offer my initial thoughts but the Post Office mangled the book and it is in my repair shop for the time being. It was a bad week for the USPS as they badly creased my issue of B&G, as well, folding it like a newspaper. Knight: "THE BATTLE OF PEA RIDGE: The Civil War Fight for the Ozarks"
Scholars and the reading public are fortunate that the only significant work addressing the campaign and March 7-8, 1862 Battle of Pea Ridge -- William L. Shea and Earl J. Hess's Pea Ridge: Civil War Campaign in the West (UNC Press, 1992) -- happens to be one of the very best studies of its kind in the entire body of Civil War publishing. 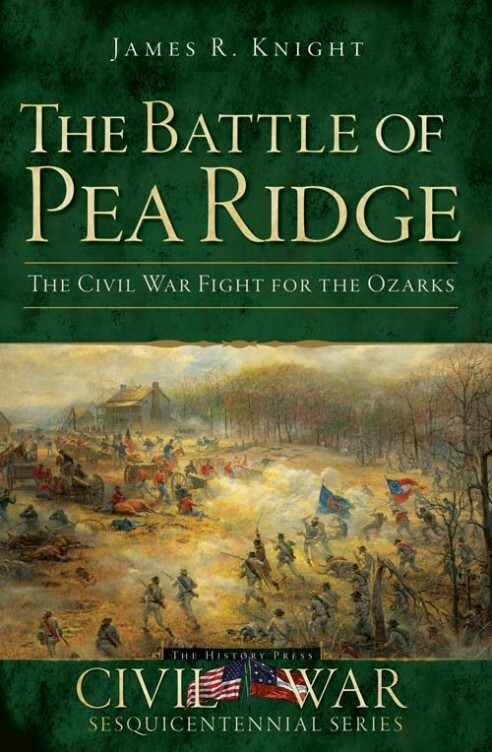 James R. Knight's The Battle of Pea Ridge: The Civil War Fight for the Ozarks, his third contribution to The History Press's Civil War Sesquicentennial Series, is essentially a compact form of Shea and Hess's definitive work. The Battle of Pea Ridge provides the uninitiated with a good introduction to events in SW Missouri and NW Arkansas in the months and weeks preceding the 1862 campaign. Both operational and tactical features are skillfully outlined. Highlighted is the skirmish at Bentonville on March 6, the bitter fighting over the next two days at Oberson's Field, Morgan's Woods, Elkhorn Tavern, Clemon's Farm, and Ruddick's Field, and, finally, the disorderly Confederate retreat to Van Buren. In assessing the actions of the commanders, and in describing and interpreting the events of the battle, Knight leans heavily on Shea and Hess, so readers familiar with the earlier work will not find themselves in possession of much in the way of new information or insights into old controversies. Instead, what is offered is an excellent account of Pea Ridge for the larger subset of Civil War readers for whom deep, micro-tactical battle treatments hold limited appeal. What the book has most in common with the better battle histories is an artistically attractive and fully functional set of operational and tactical maps (14 by my count). Topographically detailed, they provide a superb sense of how the terrain (characterized by thick, wooded ravines and striking rock outcroppings interspersed with improved farm fields and scattered dwellings) informed the planning and course of the fighting. The unit scale (regiments and batteries) is appropriate to the level of the text. In addition to the cartography, many modern photos of battlefield views and period images of the officers involved are scattered throughout the book. Complaints include the lack of a bibliography and the impression that coverage of the battle's second day was a bit rushed, but, overall, The Battle of Pea Ridge is short form campaign and battle history at its finest, with content and presentation very worthy of emulation. It is certainly one of the best entries in the publisher's Sesquicentennial series of Civil War studies. Christopher Slocombe is in the midst of researching and writing a full length history of Henry Halleck's April-May 1862 campaign, the post-Shiloh operation aimed at capturing the critical Mississippi rail junction and town of Corinth. The successful completion of such a project will mark a true milestone in western theater military historiography, so I thought I would invite Chris to participate in a brief interview about his work and its progress. CWBA: The 1862 “Siege of Corinth” campaign is probably the largest (and certainly among the most significant) remaining Civil War campaigns lacking a detailed operational and tactical treatment. Why do you think it has been neglected and what motivated you to give it a try? CS: I think that the lack of a pitched battle is what has kept the siege from receiving the attention it deserves. It also suffers from living in the shadow of its bigger and bloodier brother: Shiloh. These two characteristics, however, are what attracted me to the siege in the first place. After years of reading about western theatre operations and strategy, it became clear to me that the siege was being treated largely as an afterthought. I found that many authors covering the 1862 western campaigns implied that the capture of Corinth after Shiloh was almost a foregone conclusion, and that only Halleck’s imbecility prevented a quicker Union success. I can’t remember one book or article that took primary source material and analyzed the eccentricities of the campaign. Instead, everyone seemed to be relying on generalizations garnered from the same tired sources. Many important details were being neglected – the first widespread use of fieldworks in the western theatre, the ridiculously high rate of sickness on both sides and the military medical system’s attempt to deal with it, the political fallout from the Shiloh bloodbath, the Confederate reorganization, the small but important fights that shaped the siege, and the overarching Union strategy, among others. It seemed to me that Civil War scholars recognized Corinth to be very important but were more than willing to let the analysis stop there. I wanted to fix that and tell the full military story. CWBA: You mentioned to me that you are 5+ years into the project. What stage are you at in terms of the research and writing? CS: Aside from a few repositories I haven’t yet visited, I’ve finished my research and am now on to the analysis and writing parts of the project. If I’m being realistic, I’m still several years away from being finished. But there isn’t a day that goes by where I don’t make progress. This is a labor of love for me, and I want to make sure I’m doing it right and leaving no stone unturned. My goal is to have this be the definitive military study of the siege. I don’t want to make the mistake of not being thorough. CWBA: What unit scale are you looking at for your narrative description of the fighting? CS: I’m doing a regimental level tactical study of the entire Siege of Corinth similar to Tim Smith’s Champion Hill. In short, my book begins on April 7th as the Confederates leave the Shiloh battlefield and begin their retreat back to Corinth. The book ends with the Confederates gathering at Tupelo after evacuating Corinth. I will cover in detail Fallen Timbers, the outpost fighting of April, the multiple Farmington fights, Russell House, Shelton House, Serratt’s Hill, the general siege operations, the many cavalry raids (particularly the Federal cavalry trying to break the Memphis and Charleston Railroad), and of course the Confederate retreat from the town and the subsequent Federal pursuit. CWBA: Are you satisfied with the amount of research material available from both sides? CS: Absolutely. Sometimes I feel as if I have too much material actually – our home office itself is under siege from the mountains of material. Just ask my wife! As many folks that study the western theatre well know, there were a substantial number of troops in the Corinth vicinity in the spring of 1862. 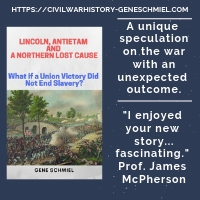 After Shiloh there was a mass concentration of forces for what many on both sides believed would be the battle that would end the war in the west. On the Federal side there were three full armies – the Army of the Ohio, the Army of the Tennessee, and the Army of the Mississippi. The Confederate side boasted two full armies – the Army of Mississippi and the Army of the West. So finding material to draw from was never an issue, but it did mean that when I started that I had a long research road ahead of me -- a lot of repositories to get to, a lot of manuscripts to read, and a lot of material to analyze. CWBA: Can you describe your process in constructing your orders of battle and strengths data? I’ve never seen regimental OBs for the campaign and only very rough estimates of numbers engaged. CS: Orders of battle and strength data are tough to compile for the siege, particularly because of the large amount of troops that arrived in Corinth on both sides throughout April and May. Also, the level of sickness experienced by each army makes it difficult to assess how many troops from each organization were sick at a given time, a given battle, etc. Some troops would be sick one day, fine the next, and sick again a few days later. Throughout the siege new regiments were being added to brigades, other regiments were switching brigades, and on the Federal side the stream of reinforcements was consistent. I’ve found that during the siege there was not one order of battle but instead several orders of battle. While a few organizational charts exist in the Official Records for both the Union and Confederate armies, in practice some of these were fluid organizations because of sickness; certain regiments would be attached to certain brigades to make up manpower lost to sickness. Patton Anderson’s Confederate brigade of Ruggles’ Division, for example, is listed for the May 9th Farmington fight to contain some regiments very different than it does at any other time during the siege. And during the May 9th Farmington fight some regiments were commanded by captains for the same reason: sickness. Thus far I haven’t dug into the strengths data to any great length, but am well on my way to creating clear orders of battle. CWBA: In terms of the extraordinary affect of sick lists on assessing the number of available effectives, the Peninsula Campaign offers similar problems to historians interested in numbers. I’m sure you want to save your best discoveries for the book, but can you hint at some surprising things you’ve found in your research? CS: There are many things. Among them is the fact that the Siege of Corinth was significant in convincing many western Union soldiers that it would likely be a longer and bloodier war than they had thought after Shiloh. One Illinois soldier flatly stated that when the Federals captured Corinth he thought that the war would be over in the west and everyone could go home. Another Union soldier wrote to his wife in 1863 about how foolish and naïve he was in the spring of 1862 to believe that the Rebels would be completely defeated once Corinth was captured. After the tactical victory Shiloh many Union soldiers thought that one more victory at Corinth would defeat the Rebels for good. After the Confederates left Corinth many recognized that it was going to be harder to achieve victory than they thought. It was a hard realization for some. Beauregard deserves more credit than he has usually been given for the defense of the town. He tried on multiple occasions to decisively attack the Federals, but terrain, bad management of troops from his subordinates, and simple bad luck failed to produce the desired results. Halleck, for his part, isn’t quite the incompetent field commander that many have made him out to be. He isn’t very good either, but he deserves to be assessed fairly. CWBA: What do you have planned for the maps? CS: The maps are something I’m really looking forward to creating. I’m sure other avid readers of Civil War books will agree that nothing beats good maps in a military history book. It is my belief that in order to make the text meaningful to readers that detailed maps with terrain features are necessary. For the battles and skirmishes during the siege there will be regimental scale maps. I’ve already read too many articles and books where I lose track of the author’s text because I can’t follow what I’m reading on a map, and I don’t want my readers to feel the same way. Besides, maps are fun, and I want people visiting the Corinth area to be able to pinpoint exactly where their ancestor’s regiment fought. CWBA: That's good to hear. What publishing options do you have under consideration? CS: I haven’t contacted any publishers yet, but will be doing so fairly soon. I’d love to have the book picked up by a publisher like Savas Beatie or a university press. If no publisher wants it, I’ll self-publish. CWBA: Thanks, Chris, and good luck. I know many of us will very much look forward to seeing the final product. Readers, if you'd like to ask Chris a question or if you have source information you think he might be interested in, you may contact him here. 1. General Abner M. Perrin, C.S.A. : A Biography by Ron V. Killian (McFarland, 2012). Many ANV brigade commanders are so well covered in the literature that they seem like old friends to the widely read, but there were a few general officers that operated under the radar. For me, Abner Perrin is one of these, and I know little about him beyond his Gettysburg service and his mortal wounding at Spotsylvania. I don't know if it is fair to say that this is the first book length biography to emerge, but I am not aware of another. 2. Civil War Lawyers: Constitutional Questions, Courtroom Dramas, and the Men Behind Them by Arthur T. Downey (American Bar Association, 2011). Of course, there are mountains of books examining court cases pertaining to prominent Civil War related issues (before, during, and after the war itself), but this book does all this while also shedding light on the lives and professional relationships of the lawyers that argued these cases. Lause: PRICE'S LOST CAMPAIGN: The 1864 Invasion of Missouri"
Given the scale and significance of General Sterling Price's 1864 Confederate campaign in Missouri, it is almost inexplicable that its standard history remains Howard Monnett's dated Action Before Westport 1864, first published in 1964 and revised slightly in 1995 by the author's son for a new University of Colorado Press edition. Several fine modern accounts of individual battles exist, but no comprehensive history of the operation exists beyond an unmentionable amateur effort from the late 1990s. 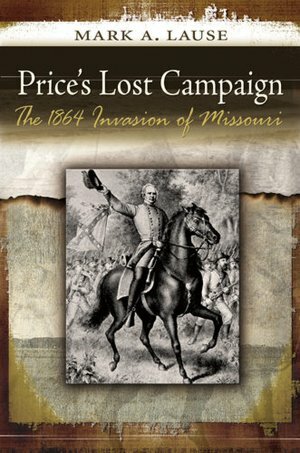 Historian Mark Lause's Price's Lost Campaign: The 1864 Invasion of Missouri does make an important contribution by filling some gaping holes, but the book is also regrettably flawed on many fronts. The early stages of the Missouri operation, the period from the disastrous Confederate attack on Pilot Knob to the Union garrison's escape to Leasburg, have been covered well by authors Bryce Suderow and Gary Scheel. In his own book, Lause has put their pioneering work to good use, but where Price's Lost Campaign really shines is in its painstaking recounting of the period between the defense of Leasburg and the Confederate decision to bypass the fortified capital city of Jefferson City and continue west across the state. The level of detail found in Lause's depictions of the fighting at places like Pacific, Union, and at the many bridges and fords along the approaches to the capital cannot be found elsewhere in the published literature. The author's quest to locate and trace the movements of a bewildering array of home guard, militia, and volunteer units as they attempted to thwart the Confederate cavalry is admirable. A listing of these formations is also nicely reproduced in an order of battle appendix. Attempting to grasp the mindset of the Union commanders defending the department, the author relentlessly criticizes the sluggish response times of generals William S. Rosecrans and A.J. Smith. Rosecrans clearly could have acted more decisively, but he did, in the end, successfully defend without any major disaster all the major points under his charge. In his harshness, Lause perhaps does not sympathize enough with the difficulties of commanding such an eclectic mix of forces (most useful only in static operations). However, the substantial body of good information presented by Lause is countered by a number of serious flaws. Perhaps most glaring was the author's decision to abruptly end his book only partway through the campaign. The lack of any original maps is another serious deficiency in a study intending to offer useful military detail. The pair reframed from much larger O.R. atlas plates and reproduced inside the book are, to put it kindly, minimally helpful. In addition to rampant typographical errors in the form of missing words and incorrectly spelled proper names, careless factual errors (e.g. Missouri State Guard involvement in events occurring before they were even formed and an erroneous awarding of a Confederate officer commission to bushwhacker Sam Hildebrand) spring up occasionally. No one will deny that both guerrillas and individual Confederate soldiers murdered civilians and captured soldiers and militia in Missouri, but there is a general disinclination on the part of Lause to separate the acts and intentions of independent guerrillas from those of the Confederate army. He allows the whole to be too generally associated with the deplorable actions of the relative few. What is most often missing in this litany of atrocities is context, with the realization that this particular scale of killing and property destruction was not as unusual, or as one sided, as depicted in the text. By the time of the Price Raid, shocking violence against civilians and surrendered combatants had been occurring for years inside Missouri at the hands of the supporters of both sides. The high level of looting and destruction directed against public and private property during the campaign was also not all that unusual. One need only look to the behavior of A.J. Smith's men earlier that year in Louisiana. Finally, the narrative is quite imbalanced. A wider use of source material, as well as a less trusting judgement of the veracity of uncorroborated newspaper allegations, might have been employed to provide a fairer and fuller Confederate perspective of the campaign. In its coverage of badly neglected subject matter, Price's Lost Campaign is alternately gladdening and maddening. While it may not always be pulled from the shelf and reexamined frequently with admiration of its scholarly analysis, it does provide more than enough to at least deserve a place there. My next interview will be with a gentleman currently five years into an operational and tactical history of the 1862 Siege of Corinth. As mentioned before, Timothy Smith's upcoming Corinth book touches on the subject, but his work does not delve deeper down the OB than the division and brigade levels. I understand that a thesis or dissertation on this subject has emerged in recent years, but have no idea how micro the military aspects of it are developed. Check back for it soon. 1. USS Monitor: A Historic Ship Completes Its Final Voyage by John D. Broadwater (TAMU Pr, 2012). Monitor books have been published in great numbers, but this heavily illustrated history of the discovery, recovery, and preservation of pieces of the vessel (most prominently, the turret), as well as the creation of the national marine sanctuary, is the work of an NOAA archaeologist with a leadership role in these projects since 1974. 2. The Peninsula Campaign and the Necessity of Emancipation: African Americans and the Fight for Freedom by Glenn David Brasher (UNC Pr, 2012). Brasher argues that the contributions of Virginia blacks to the 1862 Peninsula Campaign not only shaped military events directly but were central to advancing the viewpoint of emancipation as a national strategic necessity. 1. 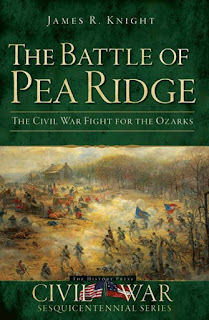 The Battle of Pea Ridge: The Civil War Fight for the Ozarks by James R. Knight (The History Pr, 2012). Knight has published three Civil War books with this press. I don't know anything about his Donelson study, but his Franklin overview was good. With a great deal of attention paid to both unit positions and terrain (even elevation lines), the original Pea Ridge battle maps that accompany this one are nice. 2. Unholy Sabbath: The Battle of South Mountain in History and Memory, September 14, 1862 by Brian Jordan (Savas Beatie, 2012). Previous histories of the fighting at Fox's, Turner's, and Crampton's Gaps by Priest, Hoptak, and Reese have their strengths, but no single work puts it all together in the manner and level of detail that this one appears to have done. On another note, from the same publisher, there's a nice excerpt available here from their upcoming collection of Petersburg battle articles.